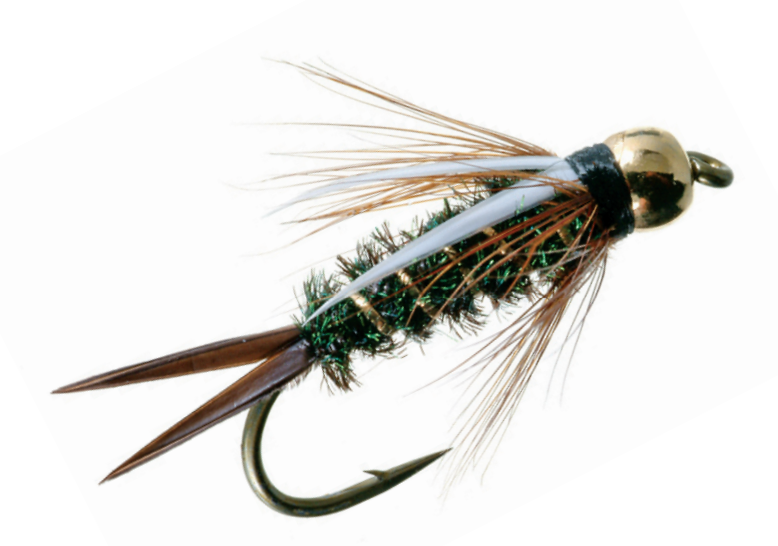 A Prince Nymph is a simple fly made of peacock herl, brown hen hackle and strips of white goose wing, all measured in pinches and wisps. The only artificial ingredient, a bit of silver tinsel wrapped around the body, is optional. I tie Prince Nymphs with the tinsel, as a matter of aesthetic preference, on size 8 hooks, which are small enough to rest on a penny. The finished product looks like something used to catch grayling, not 15-pound sea-run fish that can snap any tippet small enough to fit through the hook’s eye. 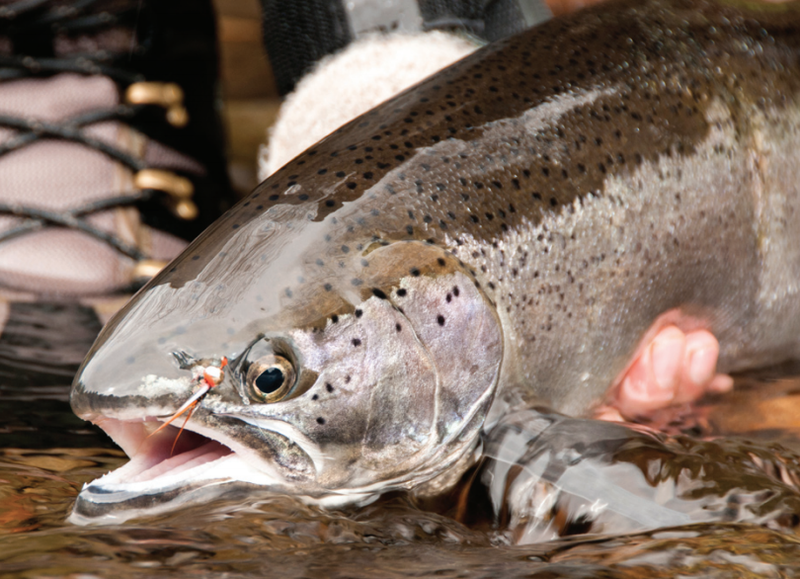 Somehow, mine get the job done on steelhead, the most challenging of all Alaska game fish. One recent April day, I sent a Prince Nymph tumbling through a riffle on a remote stream in Southeast Alaska. A series of knots connecting the tippet, leader, fly line and backing linked the fly to me, and I hoped my cold fingers had paid each knot sufficient attention. I hadn’t seen my backing yet that day—or yet that year, for this was my first day on the water after a long, cold winter. But I wished to see it soon, since nothing confirms the arrival of spring like a powerful run from the first steelhead of the season. The tiny pixel of steel and feathers drifted beyond my sight beneath the surface of the tannin-stained water. Even so, I could track the fly’s passage as accurately as if I were watching it on television. I knew the rocks on the stream bottom, knew the current and its ways. I knew the little seam in the underwater topography where the water flowed smooth and evenly—that’s where I wanted the current to carry my tumbling fly. Years of experience had taught me that if steelhead were resting in this section of the stream after their long return journey across the Pacific to their natal water, this is where they would be—if not now, then perhaps within the hour or the day. I felt no sense of urgency. 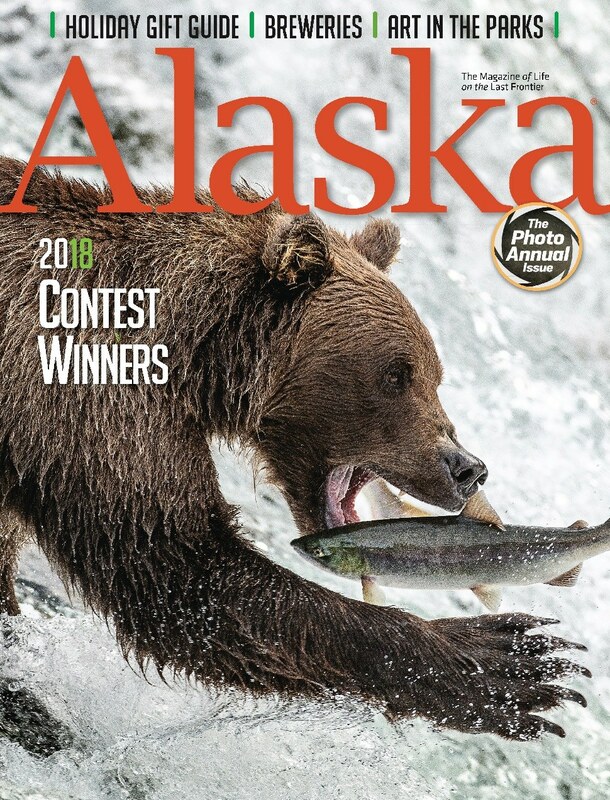 To the dedicated Alaska steelhead angler, coastal terrain and the streams running through it matter just as much as the fish, for the steelhead’s mystique proves inseparable from its habitat. Towering conifers create cathedrals in the old growth. One is never far from the smell of the sea or the pull of the tides. All this reminds me of my childhood on Puget Sound in Washington State, but that’s a hopelessly busy place now. In Alaska the coast still feels wild, because it is. Steelhead range in Alaska stretches from the southern tip of the state northward to Kodiak and the Kenai Peninsula then westward to a few select drainages on the Alaska Peninsula—but its heart lies in the Panhandle, where the world’s largest temperate rain forest receives 200 inches of rain annually and abuts the cold North Pacific in an endless patchwork of islands and bays—a jigsaw puzzle of coastlines designed by an architect who couldn’t draw a straight line. It’s a great place to be a fish—or a fisherman. Biologists have for years argued about how best to classify steelhead and argue almost as earnestly as steelhead anglers do about how best to catch them. It turns out that steelhead were members of the North Pacific salmon family Onchorhynchus all along, just like kings, sockeyes and silvers. It is also a rainbow trout, albeit in an oversized, souped-up version. 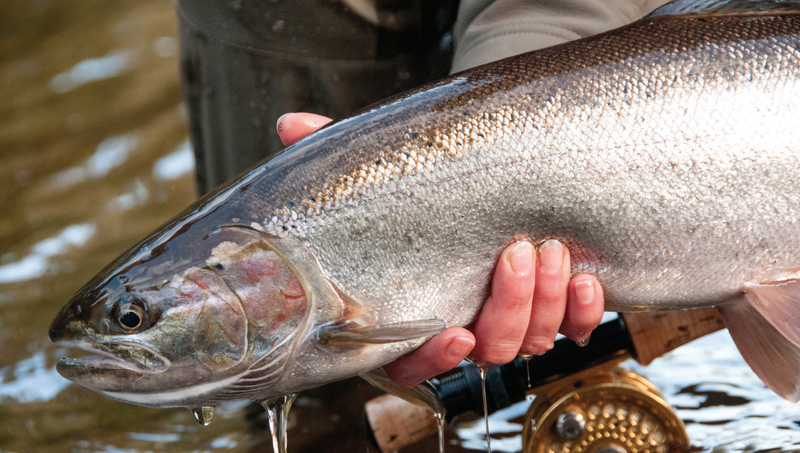 A 10-pound rainbow is the trout of a lifetime, but a 10-pound steelhead is unexceptional, and many experienced anglers regard the steelhead as the hardest-fighting game fish in the world. The distinction in size and vigor derives from the steelhead’s anadromous life cycle. Like the rest of Alaska’s salmon but in contrast to inland trout, young steelhead migrate downstream to the ocean after being born in fresh water. At sea, they grow quickly on a rich diet of shrimp, squid and marine baitfish before returning several years later to spawn in their natal streams, where the cycle begins again. Unlike other Pacific salmon, steelhead do not die after spawning, and some live to return again two or three years after their first visit. In the northern part of their Alaska range, steelhead tend to make their spawning runs in autumn. 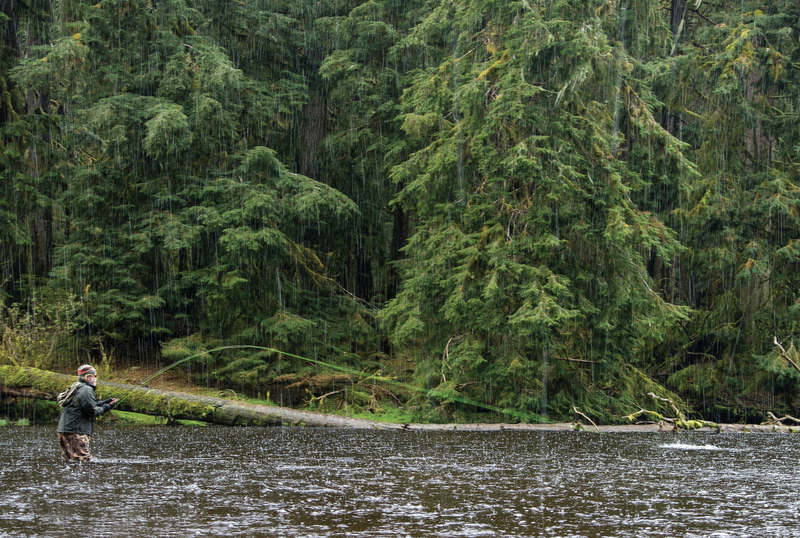 In Southeast Alaska, the strongest runs take place in spring—making them particularly welcome to anglers who have just endured a long winter. No one never really knows, however, exactly when they will return to any given river. Casting to water Lori and that may not actually hold fish can be a Don Thomas (Fly photo) courtesy umpqua feather merchants character-building experience, especially beneath clouds raining buckets. 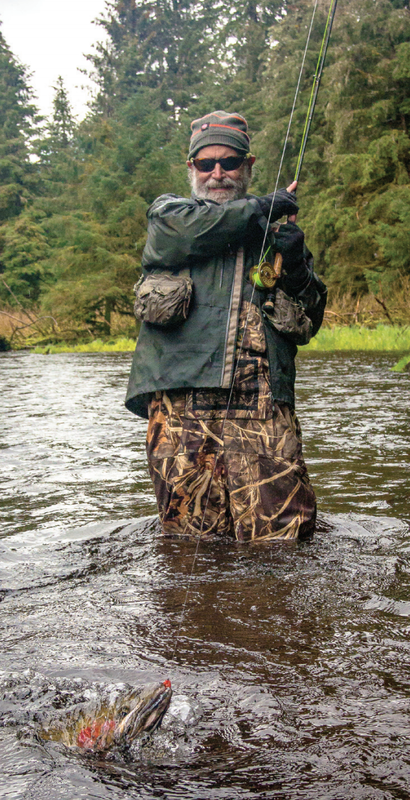 Real steelhead anglers learn to enjoy both the uncertainty and the weather. At least that’s what I told myself as I worked my Prince Nymph through that run over and over again only to have the water offer me nothing in return. Then, my line hesitated in a way the current could not explain. My response—an immediate strip with my line hand—was the result of learned reflex rather than conscious thought. Immediately, the stream came alive as a 12-pound steelhead leapt and ran, and my fly line disappeared upstream in a hissing arc—and I saw my backing at last. The steelhead had returned as they had for millennia, and I’d been lucky enough to be waiting in the right place and the right time. Alaska steelhead, E. Donnall Thomas Jr.